Currently, Italian citizenship is regulated by Law of February 5th 1991, No. 91, Presidential Decree of 12 October 1993, No. 572 and the DPR of 18 April 1994, No. 362.
a) if the applicant declares in advance his/her will to reacquire the Italian citizenship and the applicant establishes his/her residence in the territory of the Italian Republic within one year of the concerning declaration. e) if the applicant declares in advance his/her will to reacquire the Italian citizenship , in the specific case where the applicant had lost the Italian citizenship by failing to abandon the employment of another State or an international body (even when requested) and demonstrates that he/she has established residence for the last two years in the territory of the Italian State and proves to have abandoned the employment given by another State. In cases a), b) and e), the reacquisition of Italian citizenship will have no effect if the application is inhibited by decree of the Minister of the Interior, for serious and proven reasons and in accordance with the opinion of the Council of State. If the Italian citizen, during the time of the state of war with a foreign State, has accepted of has not abandoned a public job (including military service) for that State without being under obligation, or has voluntarily acquired such citizenship. Do you think you meet all the requirements to apply for the reacquisition of the Italian Citizenship? 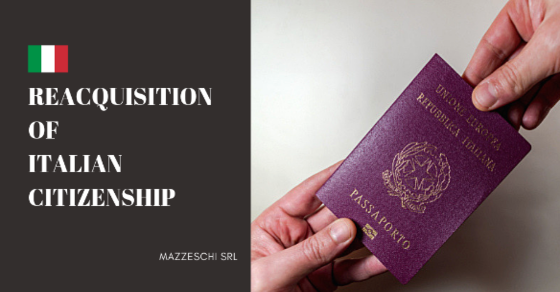 Contact us through our online form or by sending us an e-mail to citizenship@mazzeschi.it. Eligibility evaluation is free!